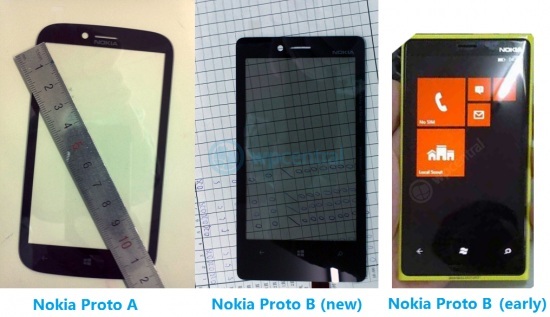 With every passing day new leaks and rumours related to Nokia’s upcoming Windows Phone 8 smartphones are flowing in. Today two new front panels of the upcoming devices have leaked over the web and go on to suggest as to how the smartphones would have a design on arrival. First is the Nokia Proto ‘A’ which carries a curved screen design which looks similar to the Nokia Lumia 710 and also indicates that the smartphone could arrive in the mid-price range. The screen roughly measures 4.3 inches diagonally which also might have the screen resolution of 1280 x 720 or 800 x 480 pixels. 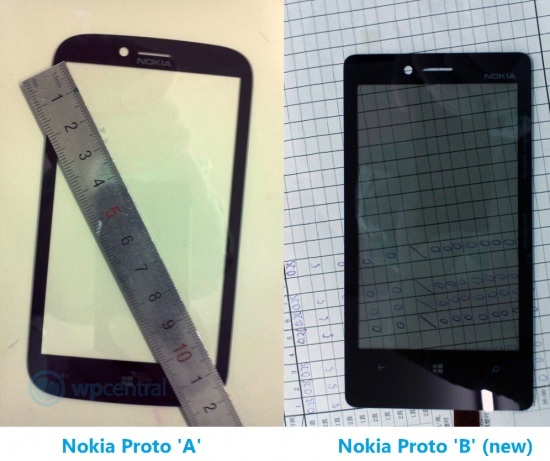 Next up is the front panel of the much rumoured and also leaked (expectedly) Nokia Phi which is here termed as Nokia Proto ‘B’. This front panel seems to have a display screen of about 4 inches and has a larger bezel at the bottom with the capacitive buttons. This second bezel also matches with the leaked early Nokia Prototype as you can see in the image below. We are still a couple of weeks away from the official announcement of the Windows Phone 8 powered Nokia smartphones and the next few days are indeed going to be interesting as we expect more leaks and rumours to follow.